Diamonds World Tour rehearsals are underway and Rihanna shared a pic from the dance studio. 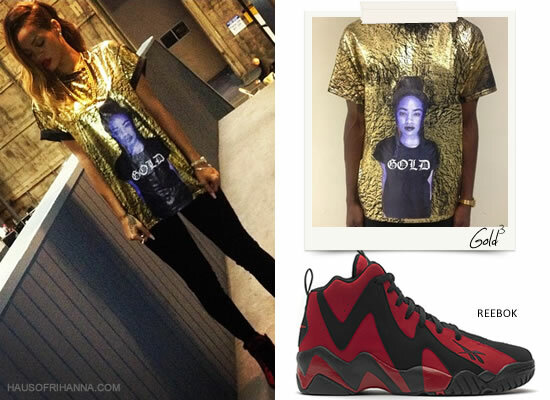 In it she’s wearing a gold cotton tee by Gold³ that features model London Zhiloh. The unisex shirt costs $60 but unfortunately it’s not available yet. You can visit their online store for more info. Rih completed her look with simple black leggings and Reebok‘s Kamikaze II sneakers in the red/black colourway. The shoes were originally worn by Shawn Kemp in the mid-nineties when the Supersonics made it to the NBA finals. The Kamikaze II are currently available for pre-order. It seems Reebok is Rihanna’s sneaker of choice for rehearsals. Last year she wore their Chi-Kaze while practising for the Where Have You Been video. Click here for that post.